We’re into Day 5 of the Toronto International Film Festival–King Street West is open once again, the hustle and the bustle of the first weekend is over, and there are still somehow six more days to go. I know. So, let’s get to our first batch of film reviews. Cheery times with the Son of Saul. It says something about the number and usual tenor of Holocaust movies that they can be referred to as a genre. Off-hand I’m sure you can think of several films to invoke the specific setting and contour of its horror. 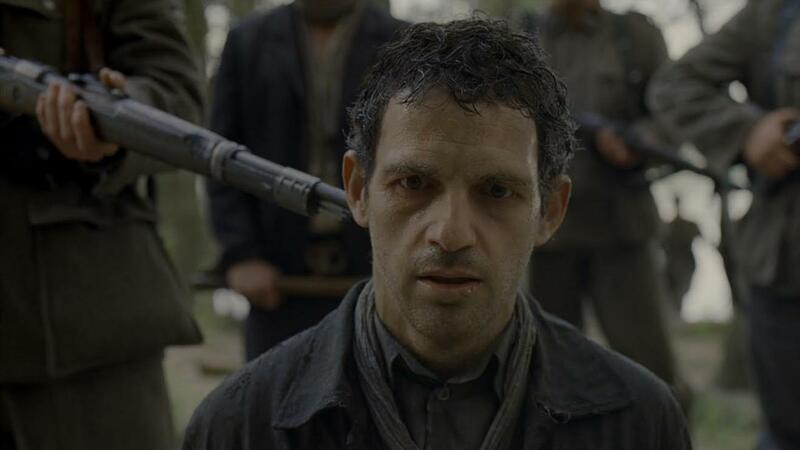 You may think you know what to expect in Laszlo Nemes’ debut feature Son of Saul. But then you’ll watch his film and see that your expectations were wrong. Saul (doggedly played by Geza Rohrig) is a Hungarian who works in a concentration camp as a member of the Sonderkommando unit. These are the prisoners, kept separate from the general doomed population, who maintain the death camps–they scrub floors, gather possessions, and stack bodies. After Saul witnesses the survival of a boy in one of the gas chambers (he is killed right after), he allows himself a moment of humanity: He will get this boy a proper Jewish burial. The film follows Saul as he stumbles around the camp to keep the body safe, stave off threats from guards and others in his unit, and to find a Rabbi. How the film chooses to show Saul’s mission is Son of Saul‘s most compelling feature, the one that separates it from other Holocaust movies. Nemes shoots the entire film in shallow-focus close-ups, largely in and around the perspective of Saul. This creates a feeling akin to being attached to an ant inside a terrifying and inexplicable anthill. In a series of terrifying long takes, we zero in on Saul and his gruesome job, the true horror of which is almost always just outside the frame. We never quite face it head on. We don’t need to. Through its relentless pace and cacophony, the film creates such a sustained visceral feeling of extreme dread it manages to squeeze everything else out–there is no room for sentimentality, or relief, or escape. Nemes knows, trapped as we are with Saul, there can be none offered to us either. Son of Saul’s setting may be familiar, part of a genre, but it is unlike anything I’ve ever seen. The Idol channelling its inner Charles Burnett, apparently. Your reaction to The Idol will depend on how forgiving you are of a simple, feel-good film from a director of such skill and vitality as Hany Abu-Assad. What he has made here is a nice movie, but is that enough? Based on true events, The Idol tells the story of 2012 Arab Idol winner Mohammed Assaf. Yes, I realize I just spoiled the ending. The point of this film is more about the beginning. It opens on four children, the most important of which, aside from Mohammed, is his older sister Nour. In a series of playful scenes, she leads the other three boys in their quest to get money so they can buy musical instruments, form a band and change their lives. Predictably, tragedy befalls the foursome and time pulls them apart. When we next see Mohammed (now played by Tawfeek Barhom), he drives a cab and has basically abandoned his singing career. That is until the calling to compete in Arab Idol comes, and a change of heart gets him going again. As Abu-Assad has done before, he has both a gentle touch with his actors and a camera unafraid to show some of the harsh realities of living in Gaza. For the kids it’s a playground, but Abu-Assad’s eye does not ignore the rubble. The tension of the film, such as it is, comes from the inherent risks of trying to leave Gaza. It’s just enough to hang the film on, but many of its plot points slide together far too easily. Characters are thinly sketched, including the music teacher who inspires the kids, and a potential love interest who reappears later for Mohammed. And, while the ending is predictably stirring, it was hard not to want more from the maker of such morally complex films as Paradise Now and Omar. So yes, it’s a nice movie, but The Idol begins to feel like something else: public service. The expressive face of Dheepan. With Jacques Audiard, it was never going to be enough to make just a movie about the immigrant experience in France. This is the director who brought us the far-reaching gangster slash prison film A Prophet and followed it up by making Rust and Bone, the only romance movie to ever involve street fighting, killer whale training and amputation. He goes for it, is what I’m saying. Dheepan tells a timely story of Sri Lankan refugees struggling to escape that country’s seemingly endless civil war. The titular character (Jesuthasan Antonythasan) is a lone Tamil Tiger thrown together with two others, a young woman named Yalini (Kalieaswari) and a 9-year-old girl named Illayaal (Claudine Vinasithamby), to solidify their sympathetic asylum status. In France, where they end up, they’ll be a family. As you can imagine, this makes for a tense existence. Dheepan gets a job as a building complex’s caretaker, Yalini takes care of a nearby invalid resident, and Illayaal goes to school. The film takes its time capturing their new lives, interacting with teachers, neighbours and students. All of these moments hum uncomfortably. To their credit, the three main actors–all first timers–carry the film’s feeling of cultural dislocation, suspicion and unease. But throughout Dheepan, there is more simmering both from within and without. Here is where Audiard, as expected, flexes his muscles. The home these three have made for themselves, already tenuous at best, also houses the operations for a large gang led by Brahim (Vincent Rottiers). 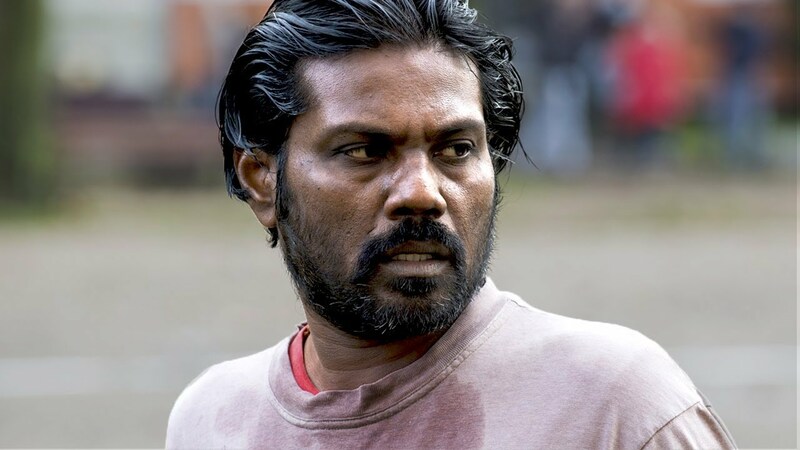 And poor Dheepan, haunted by his past, finds himself being pulled back into conflict. To his credit, Audiard does not saturate the film with violence, but instead brews its cross-cultural tension with the suspense of its inevitable confrontational conclusion. As a result (and to our relief), Audiard and Dheepan don’t have to preach at you to make their bloody point. Colin Farrell longs to escape The Lobster. David (a lumpy and forlorn Colin Farrell) is dumped by his wife and checks in at a hotel for single people. He’s told he has 45 days to find a mate so he can return to the city to live in alleged domestic bliss. If he does not, he’ll be transformed into an animal. Just in case, David has chosen the lobster. This is the basic premise for Yorgos Lanthimos‘ new film, The Lobster. And like all of his films: it is a completely ridiculous one. Nevertheless, with his unflinching camera, Lanthimos explores the bizarre world he’s created. The well-appointed hotel becomes a staging ground for his attack on the innate absurdity of human relationships, dating/courtship culture and the banalities of getting to know someone. The film pushes us to ask why we interact with others the way we do, why we allow jealousy, competition and, above all, an abject fear of loneliness to drive our social compunctions. Lanthimos tackles his extreme ideas with his usual dry dialogue exchanges (John C. Reilly and Ben Whishaw in particular have a great time with this), coupled with increasingly breathtaking and fluid visuals, like that of a slow-mo hunting session involving escaped guests. Yes, in this world this is what happens to the people who choose to live alone. They aren’t beholden to anyone, but they’re already halfway to being animals as it is. In the film’s slower second half, once Lea Seydoux has arrived as a deadpan loner revolutionary, we see there isn’t exactly a solution to be found in isolation either. We root for David and late-coming lady (Rachel Weisz, who also narrates) to figure it out, but fear the worst. In the hands of another filmmaker, this would perhaps all feel tawdry, or overly farcical. It is farcical, but with Lanthimos there is a terrifying dedication to the path he’s chosen; you’ll laugh until he tells you to gasp. The people in his film are weak and small and limited in their understanding. They’ll lie to each other and to themselves. 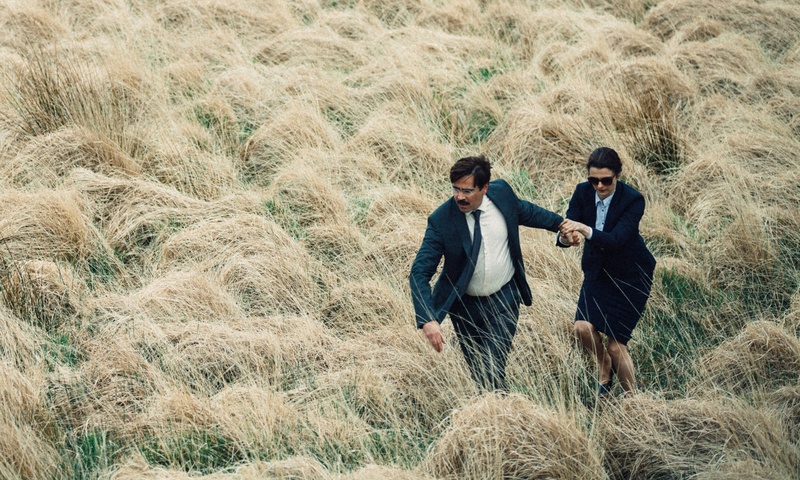 As a result, The Lobster travels, like all of Lanthimos’ work, towards a conclusion equal parts squeamish and inevitable. It’s absurd, yes, but its unblinking logic forces the audience to honestly answer the question: How far would you go for love? The smiling faces of Our Little Sister. At this point, I think I can admit I’m modestly addicted to the films of Hirokazu Kore-eda. Each one is a delicate, thoughtful piece of work that gradually explores the subtle frissons in human relationships. Unlike, say, The Lobster, there is never any violence in his movies, and it is easy to feel moved by the peace and understanding they achieve. His latest, Our Little Sister, is no different. Based on the manga “Umimachi Diary”, the film introduces us to three young women, sisters Sachi, Yoshino, and Chika, living in a large old house in small-town Japan. They learn their father has recently died and travel to attend the funeral. Once there, they meet his third wife and their young half-sister, the daughter of the second wife who broke up the marriage between the first wife, their mother. The oldest daughter, Sachi (Haruka Ayase), decides to invite the daughter, Suzu (Suzu Hirose) to live with them. This really is the extent of the plot. What follows is what happens in all of Kore-eda’s films: an exploration of human interaction, emotions and the passage of time. In Our Little Sister, he ventures outwards. We meet other people in town, observe the students at Suzu’s new school, and come to understand the dynamic between the three sisters and their romantic relationships, both positive and negative. The tension in the plot is revealed in reverse, as time passes and the characters learn more about each other we ultimately learn more about them. As a mild Kore-eda addict, the faults in his films are easy to spot. He usually runs just a bit too long, and sometimes wilts into over-sentimentality. Our Little Sister is no different, with at least one or two points that could have worked as endings. Still, it is hard not to be moved by Kore-eda’s delicate touch. If nothing else, you’ll want to move to Japan and live in a big house somewhere in a small town. Our Little Sister has that kind of calming, positive effect. Hang tight: More TIFF reviews to come later in the week!